Dr. Gandhi graduated with MBBS degree from Delhi University in India. She did her junior residency in Obstetrics/Gynecology and General Surgery in New Delhi, India, and then worked in a Government Family Practice, primarily dealing with Women’s health. In March 1979, Dr. Gandhi moved to England with her young family. From 1979 to 1984, she worked in Clinical Laboratory Medicine, which included three years as a Registrar at Westminster Hospital, a premier teaching institution in London, England. From 1984 to 1987, Dr. Gandhi worked as a Clinical Medical Officer, concentrating in the areas of Women’s Health, such as Women’s National Cancer Control, Family Planning & Community health. She also worked in Obstetrics & Gynecology and Emergency Medicine. In October 1987, Dr. Gandhi immigrated to Canada with her family. 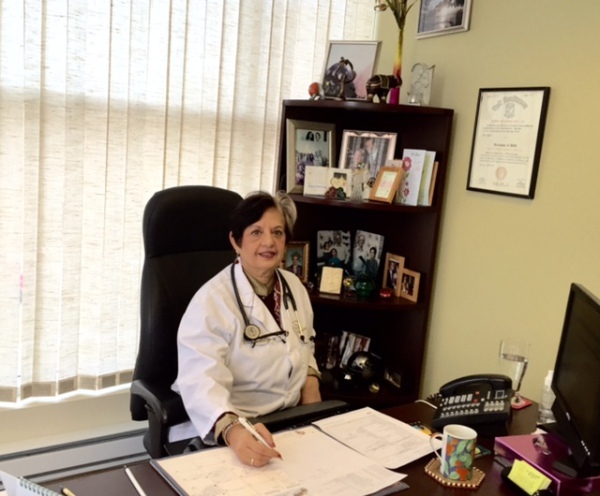 After successfully completing the medical exams for foreign medical graduates, she worked as a General Practioner at an accredited Cottage hospital in Baie Verte, Newfoundland. In January 1990, Dr. Gandhi joined residency in Medical Biochemistry at the University of Toronto, which included training in Laboratory Medicine and Internal Medicine including Reproductive Endocrinology, with rotations in the major teaching hospitals of Toronto. Dr. Gandhi completed her residency in June of 1994. In July of 1994, Dr. Gandhi obtained the General License from the college of Physicians & Surgeons of Ontario and joined Toronto Fertility Institute as a Clinical Associate. She also worked at various family practice clinics in Brampton and Etobicoke. While working at the Toronto Fertility Institute, Dr. Gandhi realized that the problem of infertility was a global one, affecting all ethnic populations. Being from an East Asian background herself, she was aware of the cultural prejudice towards infertility. Childfree living among East Asian families is generally not considered acceptable. The problem of infertility is perceived to be "taboo", and is often not discussed openly and honestly. Driven by her desire to help infertile couples, Dr. Gandhi decided to pursue Infertility Medicine. Dr. Gandhi’s diverse medical experience from three different countries, her ethnic background and fluency in East Asian languages, and her knowledge of ethnic and cultural sensitivities all contribute to her expertise in minority culture infertility issues. In July 1995, Dr. Gandhi set up her own Infertility Practice in Etobicoke to provide infertility treatment to the patients living in and around the West Greater Toronto Area. In June of 2008, Dr. Gandhi established a much larger and better-equipped state of the art Infertility clinic at her current location of 101 Westmore Drive, Suite 201, Etobicoke, Ontario. Since 1995, Dr. Gandhi has been an active staff member of the William Osler Health Centre-Etobicoke General Hospital, where she also conducts shared Pre-Natal Care with Obstetricians. Dr. Gandhi is also a Satellite IVF Consultant to the CReATe Fertility Centre located at 790 Bay Street, Suite 1100, Toronto, Ontario. Dr. Gandhi’s research on infertility has also been published in the International Societies on IVF & Assisted Reproduction. Dr. Gandhi is a member of various national and international professional bodies of Infertility Medicine such as, Canadian Fertility & Andrology Society (CFAS), American Society of Reproductive medicine (ASRM) and European Society of Human Reproduction & Embryology (ESHRE). Since 1995, she has been attending national and international postgraduate courses, conferences and seminars on infertility. Further, for the past 5-10 years she has been attending National Conferences in New Delhi for the Indian Fertility Society. Dr. Gandhi has also been involved with many educational interviews on Asian Radio and TV programs to educate couples of ethnic backgrounds of the problems and treatment of Infertility. Every few years, Dr. Gandhi organizes a party for children born from infertility treatment. Dr. Gandhi is passionately interested in Women’s health and Infertility Issues. Children born through We CARe have brought joy to the lives of many infertile couples, who may not have otherwise been able to conceive. Being herself an East Indian woman, a mother, and a medical doctor, Dr. Gandhi brings the best of her compassion and experience to her practice. Dr. Gandhi’s motive has always been to bring happiness to and make a difference in the lives of her patients.